We round up 13 of the best Minecraft texture packs, if you're looking to reskin the game. Minecraft texture packs are essentially a way of changing how the base game looks. Want a more cartoony feel? Maybe you’re looking to build a medieval castle? Whatever you’re after, chances are, there’s a texture pack for exactly what you want. Installing texture packs is nice and simple. Just follow the brief guide below and you’ll be up and running in no time. If, however, you find a texture pack that doesn’t work correctly, you may need to roll back your version of Minecraft to an older iteration. You can find out how to do that here. And don’t forget, whether you’re looking for the best Minecraft seeds, Minecraft console commands and cheats, best Minecraft servers, or are even wondering which version of Minecraft is better, we can help with everything you need. - Download the texture pack (it may come as a .Zip file, don’t extract it). - Next click ‘Resource Packs’. - From here, drag the texture pack file into the folder. - The texture pack should now appear in the list of usable add-ons. Although Minecraft is built upon having a rustic aesthetic, sometimes you want your world to gleam with beauty. That’s where the LB Photo Realism pack comes in. Every texture in this pack has been painstakingly reworked to make it look as realistic as possible, from shimmering water surfaces all the way to how trees appear more textured, this is one pack you won’t want to miss. Grab it here. Minecraft evokes that feeling of 8-bit nostalgia that we’re all susceptible to, over a certain age. With the Retro NES pack, you can turn the clock back and relive your youth, so long as you’re over the age of 30 that is. Now you just need to get to the Nether and turn the whole place into one big Bowser fortress. Get it here. We couldn’t go without mentioning arguably the best fantasy pack out there for Minecraft. Whether you’re looking to build a castle with a sprawling courtyard or fancy creating a western theme park with killer robots, the John Smith pack has all that and more. This pack has become the go-to staple for many players, and if you happen to find yourself looking on YouTube for build guides, it’s likely this is the pack you’ll see used. It’s funny how many people don’t use the default Minecraft textures. Not because they’re bad, per se, but there’s only so many hours you can lose before those muddy textures start to outstay their welcome. And yet, changing things up too drastically makes everything look weird. For all the inbetweeners out there, do check out Default 32x32, it’s kind of like a plastic wrap texture that keeps the original style intact while still feeling fresh. Hands up if you’ve ever seen a lone block and just had to remove it because the sight of it being out of place made you shudder. To avoid ever having to deal with rogue blocks and misshapen landscapes, this pack removes noise and harsh colours, changes spacing so most terrains are even, and sets all angles at 90 degrees. Not bad, eh? You can find it here. While you can make modern buildings with the default textures, you’re limited in what you can and can’t use. Any white and black blocks work, but try using cobblestone and the build falls apart. To fix this and more there’s the Modern HD pack, which offers a more contemporary feel. Now there’s nothing stopping you from building the house of your dreams, which you're pretty much guaranteed to never afford doing in the real world. Aww, c’mon, who doesn’t want to build their own replica of the Ice King or Princess Bubblegum's castle? Even if you’re not a fan of the show, then there’s always the option of using this one as a neat little cartoon texture pack. Pick it up here. According to my notes, Halo is a first-person shooting game where you shoot aliens in the head a lot—I hear it’s pretty popular. If you would like to give Minecraft the Master Chief treatment, then this is the texture pack for you. Now if only there were an option to fire actual halos on people’s worlds. Imagine the griefing possibilities. Okay. The FNaF fanfare may have died down some time ago, but that doesn’t stop this pack from being cool. Mobs, as well as armour, have all been changed to mimic each of the nightmare-inducing animatronics. I’m pretty sure with some minecart exploits and redstone you could, maybe, make your own FNaF chamber? Just remember Chica is still a creeper, so expect far too many explosions. In what has to be the most self-explanatory heading ever, this one is a Star Wars pack, and if you're a fan of great movies like The Last Jedi, you should pick it up. And before you ask, yes, all the swords have been changed to lightsabers. Even the bow has been altered to be a stormtrooper’s gun, complete with the ‘pew pew’ sound effect. As an alternative to Modern HD, Urbancraft is perhaps better for creating large scale cities. Think hulking skyscrapers and high-rise flats. If you plan on creating your own city, don’t forget to grab the Instant Massive Structures mods, which lets you drop down complete buildings at the click of a button. Much like the official Candy texture pack, Sugarpack combines the love of bright colours and confectionary. MnM blocks? Check. Candy canes? Check. Exploding chocolate bunnies? I mean, check, but it's as terrifying as it is cute. 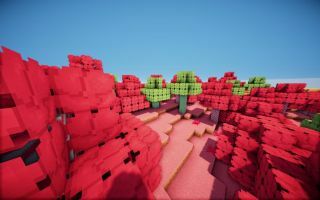 16-bit visuals marry Minecraft’s blocky terrain in a pack that almost looks like it could have been created by someone at Nintendo, it looks so damn pretty. Just stay away from the Villager/Toad people because hell, what even are they? You can pick it up here.